Raised in St. Petersburg, Shapran danced everywhere as a child, to the point that a friend mentioned the Vaganova Ballet Academy to her. Her mother, an accountant, and father, a geologist, took her to the Mariinsky for performances, and Shapran vividly remembers her shock when she discovered La Bayadère. “When I saw Nikiya's scene with the snake, I was paralyzed. I couldn't even speak during the intermission. I just knew that someday I would be playing that role." That determination served Shapran well when she entered the very competitive Vaganova Ballet Academy at age 9. “My childhood was over then," she says seriously. “It was a completely different level of emotions, very hard work." The 90-minute commute from her home involved taking the bus, the metro and walking to the Academy on her own. In class, with her naturally arched feet, Shapran had to work especially hard to gain stability. By her graduation in 2011, she was considered one of two wildly talented students in her age group who were likely to take the Mariinsky by storm. The other was Olga Smirnova; the two shared the role of Nikiya in La Bayadère's Shades scene at their graduation performance. In a shocking move, however, both shunned contracts at the Mariinsky. Like Smirnova, who joined the Bolshoi, Shapran was offered soloist positions by all the top Russian companies, Mariinsky included. She also opted for Moscow, but joined the Stanislavsky Ballet, directed by Igor Zelensky. “I believed in Zelensky, as a person, as a professional, and I wanted to work with him," she says, adding after a pause: “The Mariinsky was the absolute best to me, but I was also afraid. I thought I wasn't ready or worthy of it yet, that I would get worse." Shapran with Konstantin Zverev in "Cinderella." Photo by by Natasha Razina, Courtesy Mariinsky Ballet. While the Stanislavsky offered Shapran the chance to dance principal roles immediately, including Giselle, Nikiya and Roland Petit's Coppélia with Sergei Polunin, the transition was far from easy. She looks back on her three years there as her “school of life," she says. “When I was younger, I was always protected—by my mother, my teachers. In Moscow, I realized I was really alone." Challenges included adjusting to the more extroverted Moscow style and learning to work with a hands-on coach, who liked to oversee not just rehearsals but also her charge's life outside the theater. “Sometimes it's better if an artist can breathe," Shapran says. After three seasons, she couldn't shake the feeling that it was neither the right city nor the right company for her. 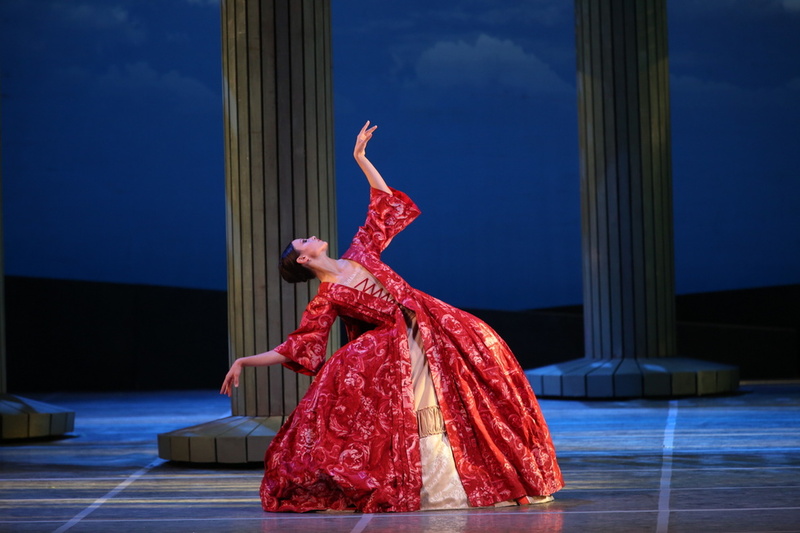 When her former Vaganova director and teacher, Altynai Asylmuratova, took up a coaching position at St. Petersburg's Mikhailovsky Ballet, Shapran saw an opportunity and joined her there as a principal in January 2014. The arrangement lasted less than six months, however. “There were intrigues that made the atmosphere uncomfortable, so we both decided to leave," Shapran explains. Shapran in "Giselle." Photo by Valentin Baranovsky, Courtesy Mariinsky Ballet. The young ballerina got in touch with Fateyev, whom she had refused three years earlier. “I didn't feel angry about it anymore," Fateyev says. “I think she was too young at the time." He hadn't seen her dance since, yet he welcomed her as a first soloist. “You don't lose talent. Even at school, I knew she would be an artist—she was so charismatic, so individual." Her return to the Mariinsky fold in the summer of 2014 was an unexpected twist: The company's attractiveness had been on the wane, and Smirnova and Shapran's departures were considered proof of that. With her lyrical sensibility, however, Shapran proved a natural fit there. She hit the ground running, performing Apollo on tour in London within weeks of joining. Last season, her first with the Mariinsky, she accrued over a dozen principal roles, from Giselle to Angelin Preljocaj's Le Parc. Above all, Shapran relishes the Mariinsky's intense schedule—the company often works seven days a week, with no cap on rehearsal hours. “At the Stanislavsky, after a performance, there could be a two-week break. It's the worst thing for a dancer. Here, I rehearse every day; I'm completely overloaded with work." Fateyev and Shapran's coach, Elvira Tarasova, have provided guidance and challenged her to gain strength. “She feels the music, the steps, the character, but she needed to be helped technically, so I made very ambitious plans for her," Fateyev says. This season, she's scheduled to make her debut in the ultimate Mariinsky role, Odette/Odile; in December, she will guest with the Paris Opéra Ballet in La Bayadère. Shapran in "Apollo." Photo by by Natasha Razina, Courtesy Mariinsky Ballet. And Shapran now feels deserving of calling the Mariinsky her home. “We were raised with such deep respect for this stage that I was in awe of it," she says. “Now I feel more mature. It's like a puzzle that has come together." Exploring the Russian company's large repertoire will take time, but she also hopes to work again with Jirí Kylián, whose Petite Mort she danced in Moscow, as well as with young, up-and-coming choreographers. Shapran lives close to the Mariinsky, and says she has few hobbies: “I have a very narrow focus at the moment. Every role is like a baby, and ballet is my life, my boyfriend, my husband." Her only indulgence is regular theater outings with her sister. Unsurprisingly, Shapran also dreamed of becoming an actress as a child, and a couple of offers to star in movies have already landed at her door. For now, however, she is finally ready to tackle the role of leading lady on the ballet stage.